The NYC DOE Social Media Professional Development is offered by Lisa Nielsen, the Director of Digital Literacy and Citizenship for the New York City Department of Education. She offers professional development designed to develop skills and provide resources for the adults who work with students so they can help them become responsible, safe, literate users of digital media who are prepared for academic, career, and social success. This publication was supported by Federal Library Services and Technology Act funds, awarded to the New York State Library by the Federal Institute of Museum and Library Services. 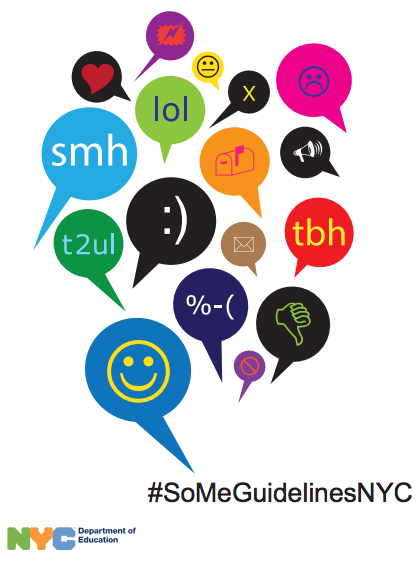 The guide contains sample lessons from grades 1 to 12 in the areas of responsibility and online safety. The lessons are aligned to the NYC Information Fluency Continuum and Common Core Learning Standards. These Social Media Guidelines provide guidance regarding recommended practices for professional social media communication between DOE employees, as well as social media communication between DOE employees and DOE students. It is important for school and central staff to use tools like social networks, blogs, websites, and other online media in a way that protects the privacy and safety of our students and employees. To that end, we have updated the DOE’s social media guidelines to incorporate feedback we’ve received from educators (get translations of the guidelines). It includes a robust FAQ section of questions that we’ve received in information sessions and by email at socialmedia@schools.nyc.gov. Additionally, professional development (staff should log in with their DOE username and password) is available for school staff. Schools should be in touch with their network or send an email to SocialMediaPD@schools.nyc.gov for more information. The DOE’s Internet Acceptable Use and Safety Policy (IAUSP), provides additional information on appropriate Internet use. In an increasingly digital world, we seek to offer our students the opportunities that multi-media learning can provide, which is why we allow and encourage the appropriate use of these powerful resources. As we challenge our students with new methods of learning, we continue to ensure that these tools are used responsibly, and enrich the learning environment in our schools. With that in mind, we have created social media guidelines for students who are 13 years old and over. In the coming months, there will be interactive materials for students. Professional development is available for school staff (log in with your DOE username and password).